What a year! If I had to describe 2017, I would say it was a year of hidden growth. Not pleasant, but not terrible either. It was a year of learning to move forward when many of my dreams and plans went down the toilet. As I was learning to operate through some heart-deep disappointments, I found myself not producing much. Not just in how much I sewed, but through any outlet. There wasn't many tangible things to show for 2017. That's not a bad thing; it's just how last year went. I already feel that 2018 will be a different sort of year. I can't say exactly why, and maybe it's just wishful thinking. However, I am already thinking of this year as the year of expressing myself. I've grown so much this last year and I have so many opportunities ahead of me as a result. I'm looking forward to stepping into this year with everything I am and seeing the changes around me and in me that come from walking in a place of joy. When it comes to my sewing, I want to intentionally focus not just on more, but on more intentional wardrobe building. I have been sewing things that are pretty, but then finding myself not wearing them because they aren't what I need for everyday wear. This year, I want to define what I'd like to wear and then sew that. For example, I often sew dresses, but don't wear them daily, so I need to quit sewing them so much. I wear pants and shirts, not even skirts generally. I want to focus on wardrobe staples that I can wear and find joy in every day. 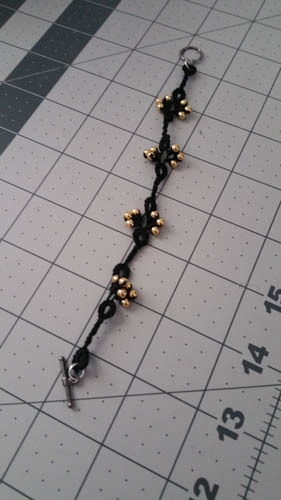 Besides the type of item I'm sewing, I want to begin sewing connected items. Capsule-ish, but with more options. I'm calling it 3-D Capsules. It's about finding looks and colors that I enjoy and then building many options that will fit into it. I'm going to do a entire post on 3-D Capsules to explain them in more detail. Here's to 2018, whatever it may bring, I hope to traverse it with grace and joy! And hopefully lots of sewing! Posted in General. Tags: 2018, diy wardrobe, new year post, personal, sewing resolutions on January 1, 2018 by ladyreed. 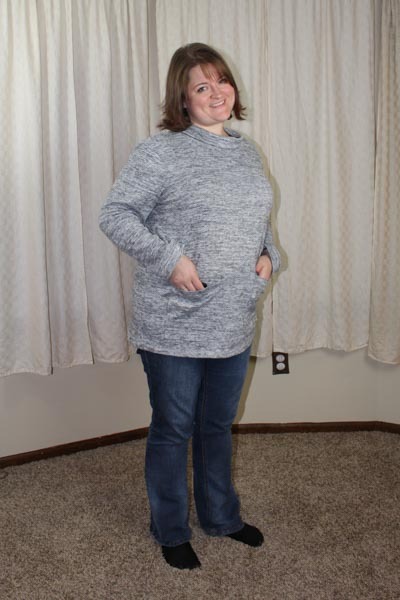 I have a new favorite comfy sweater! 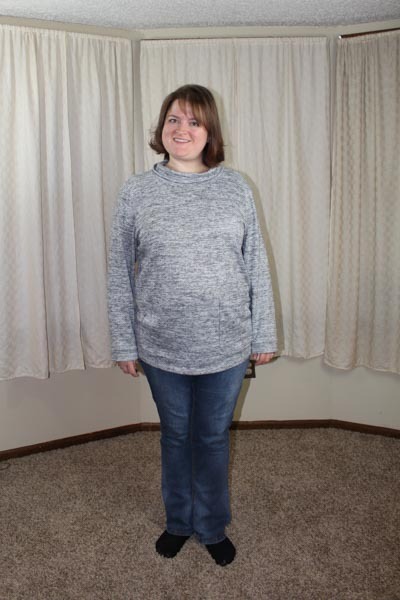 This is the Seamwork Sadie made in a lightweight sweater knit from Fabric.com. It's oversized without feeling too overwhelming, and just the right amount of cuddly. I cut a large. My only alteration was to add a 3/8" FBA along the seamline and adjust the sleeves to match. I think it's loose enough that I could have gotten away without that, but I'm glad I did it. The extra space really helped it hang nicely. 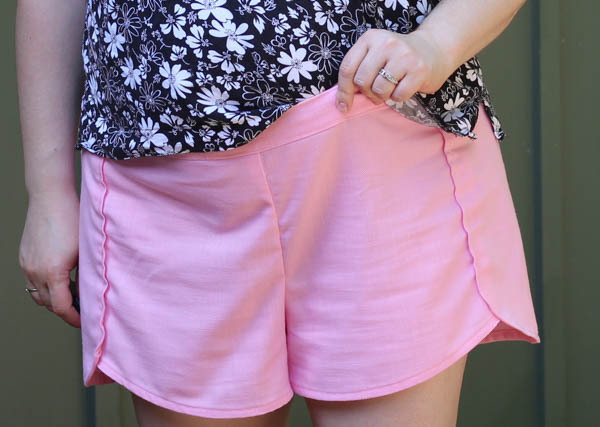 My biggest learning curve with this one was about how to sew on this soft, lightweight fabric. I've usually been able to get away with just adjusting stitch widths or lengths, etc. to make the fabric behave. This time, however, no matter what I tried, it was always terribly wavy. I had to re-cut the front piece because I ignored my own good advice and stitched the pockets down without doing a sample first. The fabric was so soft and the thread matched to perfectly that I wasn't able to pick out stitches without putting holes in the fabric. Fortunately, I had just enough fabric to eek out a new front piece and try again. The difference in the wavy-ness was hard to photograph, but you can kind of see it between these Instagram posts. All this topstitching was for attaching these deep pockets. They are wonderful size. 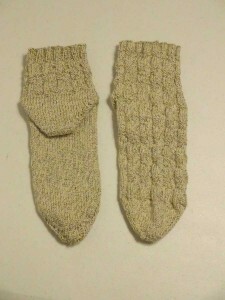 Since I used such a lightweight knit, however, I can't put much in them. They end up just sagging! I love this top and it's perfect for cold winter days. This cowl is awesome for keeping my neck happy and toasty as well as looking styling! Posted in General on December 26, 2017 by ladyreed. Seamwork Gabrielle, I feel pretty! My sewing has been so inconsistent lately. My sewing energy was nonexistent for a while and I'm only lately having the energy and focus to even try sewing. When I saw the Gabrielle dress, I knew I had to have one! 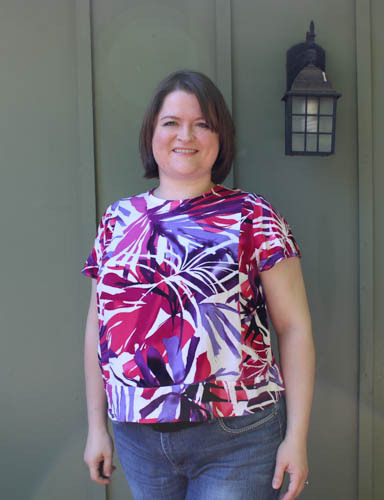 I searched for purple ponte and found a lovely rose print from Fabric.com. 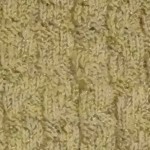 I sometimes still feel like I'm only so-so on buying fabric online and loving it, but this one was a win! It's a great weight-heavy like ponte should be-and not too pricey. Getting my new machine set up and running didn't take very long (I even re-threaded it, with no problems!). 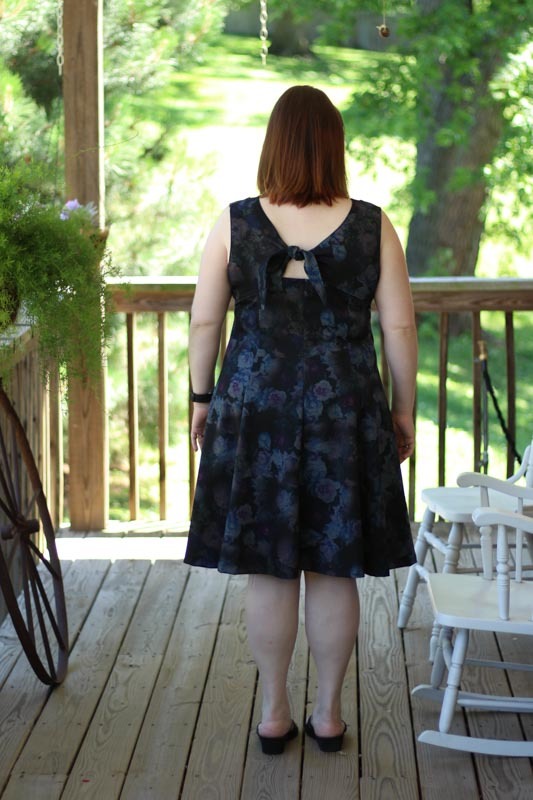 The dress was an easy sew. I'm not sure how long I actually spend on it, because I sewed a little bit at a time on this. Sometimes I'd only sewing a couple seams before calling it a night. Even with my slow pace, it came together fairly quickly. Since I didn't force it, I felt good the entire time, no burn out. Feels good!! On a side note, I thought I'd be smart and buy less fabric than it called for, but then I ran out. Fortunately, I was able to squeeze it out by only lining the tie portion of the back tie piece instead of the whole thing. And I thought I was so smart.... oh well, live and learn and buy the right amount of fabric! I cut out a XL (my measurements are 47.5"/41.5"/47") with approximately a 1" FBA. That makes it sound fancier than it was; I gave myself extra seam allowance at the bust and free-handed more width at the princess line bust point. Overall, it turned out a little large. I took out nearly an inch out of both sides seams and I still had to stitch down the top back tie piece to keep my bra from showing. I would definitely go down a size if I made it again, but keep the free-handed FBA. Those familiar with the pattern may notice that this is a sleeveless version. I would like to pretend that was a thought-out and brilliant plan, but actually, I was tired and forgot them. Yep, I forgot to put in the sleeves. Instead, I hemmed the armholes. When I realized what I'd done, I figured I could go back and put them in if I want, but just wanted to be done. For now, I'm kind of liking it sleeveless. The tie detailing on the back is fun! Posted in Sewing. 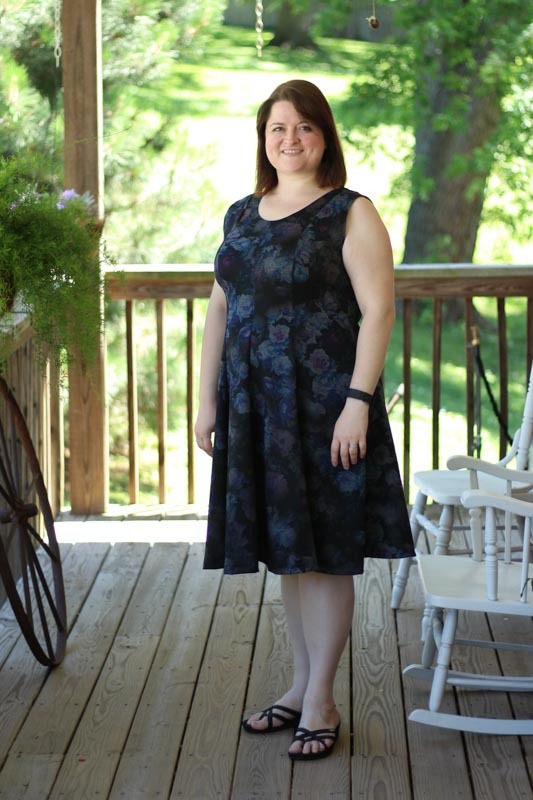 Tags: completed project, diy dress, dress, dress sewing, seamwork, seamwork gabrielle, sewing on June 24, 2017 by ladyreed. These shorts make me so happy! If you'd asked me if I wanted a pair of pink shorts before I laid eyes on this fabric, I would have said no. But little did I know that I needed them. Truly, needed. 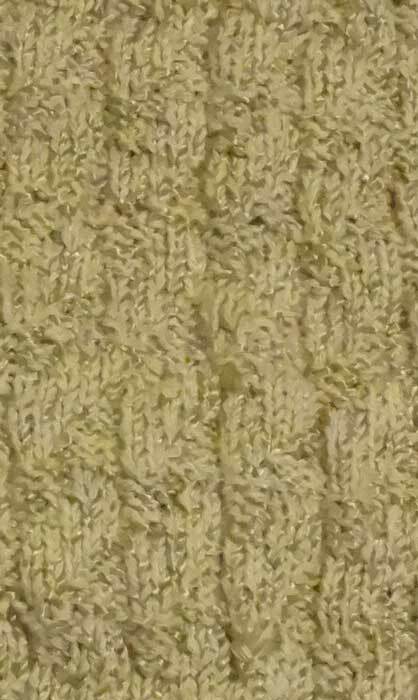 The fabric claimed it was linen (bought from the late Hancock Fabrics), but it wrinkles so little, I suspect it's a linen/poly blend. It's also lightweight and slightly see-through, so I will have to be conscious of undergarment choice. Other than that, it's perfect for summer shorts! 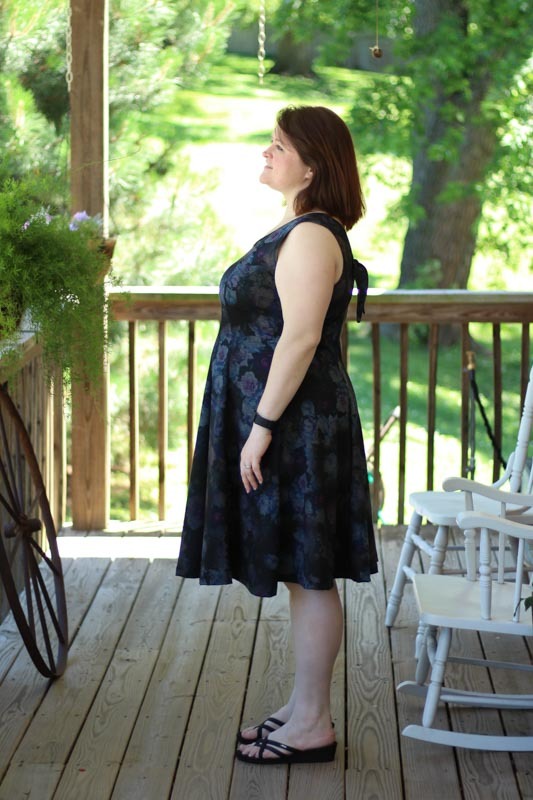 The pattern is Seamwork's (referral link) Nantucket. It was a really quick sew and only a couple minor alterations. I raised the front and back crotch slightly as well as adding overall length, starting from a 16. I also have a personal distaste of drawstrings. So, I altered the waistband to be flat in the front and gathered in the back. This worked beautifully with one exception. 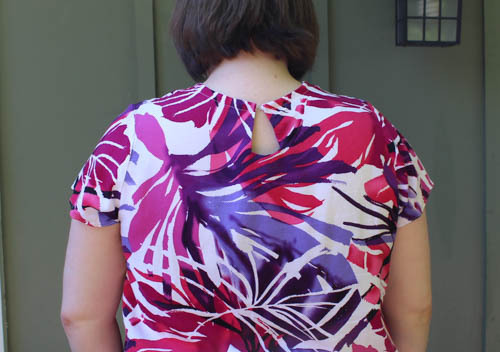 When I sewed in the elastic on the back, I wanted the sewing to look like ready-to-wear. I zigzagged over the elastic to try to get it closer to that look. However, it stretched out the elastic really bad when I did, so now the waist band is slightly too large. In addition, I should have taken some waist width out to account for the flat front, so it's all a little too loose. I'll have to take it in soon, as it tends to fall down to underwear showing levels. Now, I have a fun pair of cool short to wear and they please my inner child. Fun in the sun! 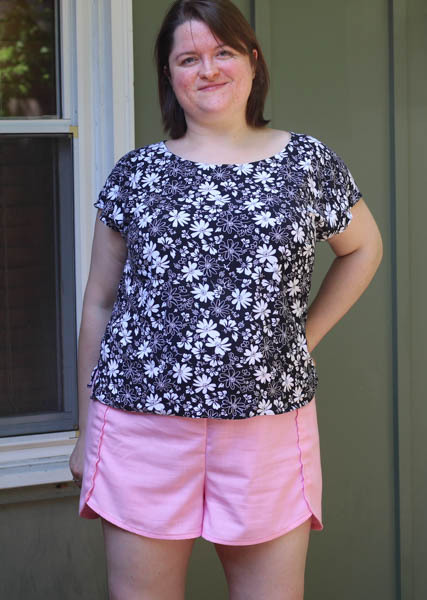 PS: I finished these shorts just in time for the last heat wave to break. Isn't that just the way? By break, of course I mean that it's now mid- to upper-80's. Still summer and all of August left to go. Posted in Fitting, Sewing. 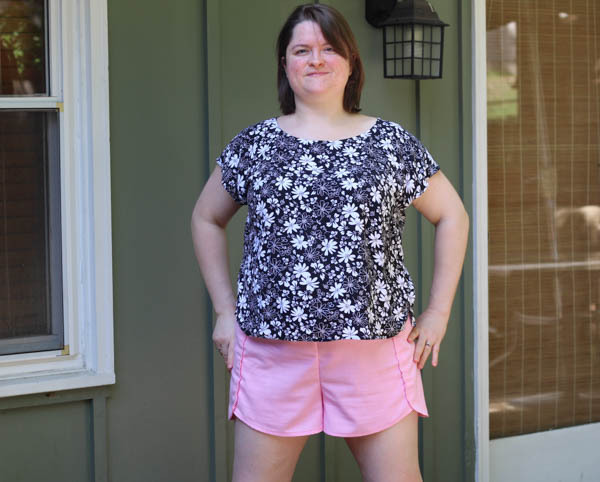 Tags: completed garment, diy wardrobe, finished garment, fitting, i sew, linen, nantucket, pink shorts, seamwork, seamwork Nantucket, sewing, short sewing, shorts on July 27, 2016 by ladyreed. I was digging through my stash and when I came across this fabric from who knows how long ago. I thought, there's enough here to muslin the Adelaide! I liked the blue roses and it seemed like a summery dress, what could go wrong....? After looking at it a bit, I realized it would be too sheer to wear as is, so I decided to line it. No big deal. Since it's sleeveless, I would need to find a way to line it that would clean finish. No big deal. So after fiddling with fit and fabric and finally getting it all sewing, then it sat for awhile as I couldn't find all the parts to my snap installer thingy. Finally, after way to long, I got this wrapped up. Overall, the fit of this dress is pretty good. I give it B- in fit. For quality of construction I give it A-. But for fabric selection I give it C or maybe D. I feel like I'm clothed in drapery. This didn't occur to me until the first time I tried it on, so I don't know what I would have done differently. This pattern was the first pattern I'd done an FBA on that didn't have a waist seam. I followed the Curvy Sewing Collective instructions here and got the front piece done, no problem. Then, when i tried to true it up to the back, it was all kinds of wonky. I knew it would pull really bad from the apex to the waist and it did. I split the difference between the pieces in half and added it to the back piece to get it lined up better. There's still some pulling, but it masquerades as needing more FBA room, which I don't think is true. (You can kind of see it in the above picture.) I'll keep practicing with this and see if I can figure out more of what I did wrong. This doesn't wear all that comfortably. The snaps need to be closer together on me, so it gapes funny. It's nice for around the house or quick errands, but it's not good for any place I'll be sitting. I'm not actually sure I'll make this again. I don't love how it fits on me and and I don't feel particularly awesome in it. 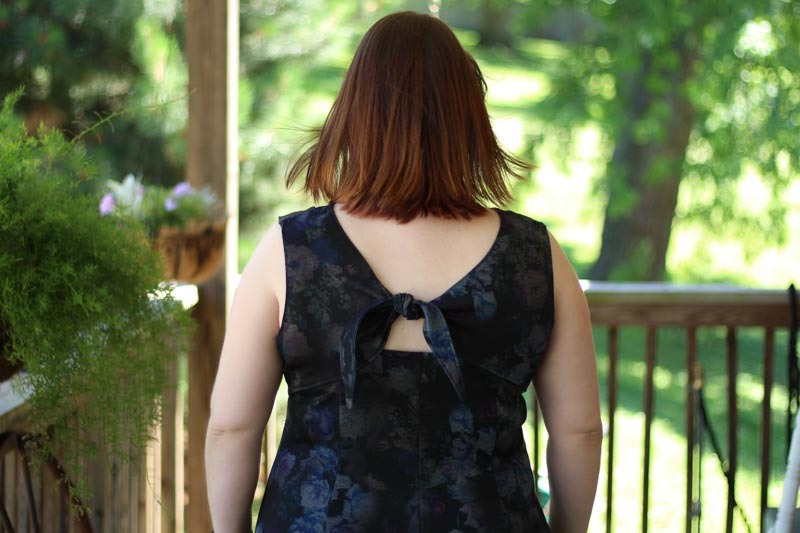 It's OK and it's good to have a quick make (now that I got through this round) summer dress in my arsenal, but it won't be a go-to pattern. Sewed side seams above pocket at 1/2"
Sewed the bottom seam of the waist tie at 3/8"
Add more snaps. Due to all my fit fiddling, the snap marks weren't right anymore. I evened them out, but in the future, I'll add more. I might even go as close together as 4" and then add as many as I need to get down to the bottom. It gapes weird now. Remember to sew the side seam at 1/2" BEFORE putting the pockets in. I'm on the fence about the length. I shorten things by 2" by default as that's a good start. I like the length when looking at the front, but the back seems kind of short to me. Next time I may add some length back in. Posted in Fitting, Sewing. Tags: adelaide, button down dress, completed clothing project, completed project, diy wardrobe, dress, dress sewing, fitting notes, seamwork, seamwork adelaide, sewing, wearable muslin on July 20, 2016 by ladyreed. 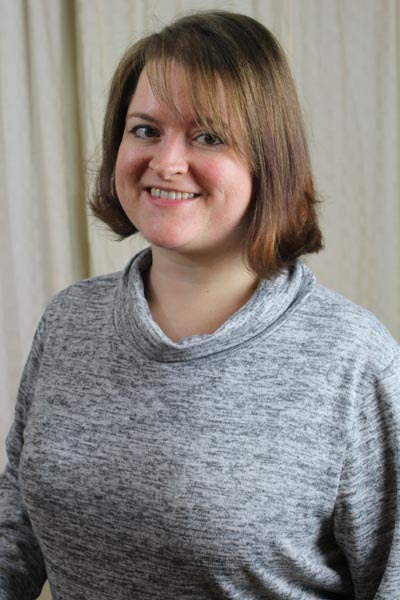 Happy Blog Birthday to me! One year ago I posted about a top that I love and wear often. I only posted a small percentage of all the things I made in the last year, but I love all the things that I posted and the things that I didn't. Here's to another year of beautiful makes! This is an awesome finish that's way high up my favorites list. I love the fabric (rayon) and the print. As much as I like it, it's not on my all time favorite makes because the fit isn't quite right. I made quite a few adjustments, so even though it isn't perfect, it's pretty good. Shortened the bodice by 3"
I need to make a couple of changes to the front still. I did a 1.5" FBA on the side princess line piece and only took out .75" back out at the waist. I think I need to take a little more out of the princess line seams. The neckline is still a little weird. One recommendation from another sewing friend (thanks, Sarah!) is to take a 1/4-1/2" from the front shoulder line. Since I will probably be making this again, I might play around with that. The back isn't my favorite as it's not as flattering, but I think I could make it better with a few fitting tweaks. I didn't have a button that I liked for the closure, so I tried using a hook and eye. Bad idea. Technically, it works. However, the neckline doesn't sit correctly as it needs a little bit of the gap the button closure provides. In addition, if the tension gets off the hook and eye pops open. One of these days, I'll fix it and add the button. You know, as soon as I have time. Ha! 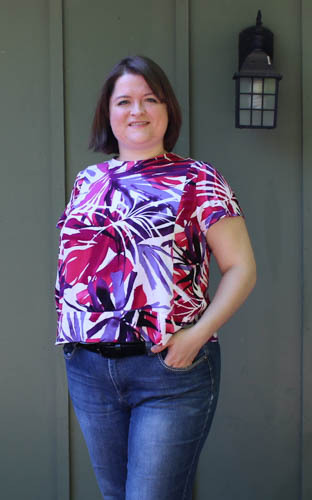 Overall, a comfortable shirt that will be getting a lot of wear and a great pattern that I will be glad to make again. Posted in Sewing. Tags: diy wardrobe, hayden, seamwork, shirt on June 9, 2016 by ladyreed. Since I did a post about my initial ideas on Me-Made-May, I thought I'd follow up on it now. I'm glad I didn't do a pledge about it, because it went pretty much as well as I thought it would. Which is to say, not much different than every other month. I wear me-mades two to three times a week, occasionally less depending on the status of laundry. While my number of me-mades has grown since the first year I did it, I still don't have the wardrobe for a full month. I got this from a Craftsy class with Marilee Rockley (links are affiliate links). It's a great class and this is the second things I've completed from it. The first was a necklace, bracelet, earring set. By completed, of course, I mean I finished the tatting but not the findings. I guess that still counts? Either way, I enjoy tatting when I want something easy and pretty and fun to keep my hands busy when I can't sew. Click to check out the class! Posted in Tatting. Tags: bracelet, jewelry, me-made-may, mmmay16, tatting on June 8, 2016 by ladyreed. It's one of my favorite months: Me-Made-May! I haven't made a pledge because I'm absolutely sure I'll not be able to keep it. Either way, I love it! I spend way too much time on Instagram this month. I wore one of my oldest makes as it was made for the first Me-Made-May I participated in and I was feeling sentimental. 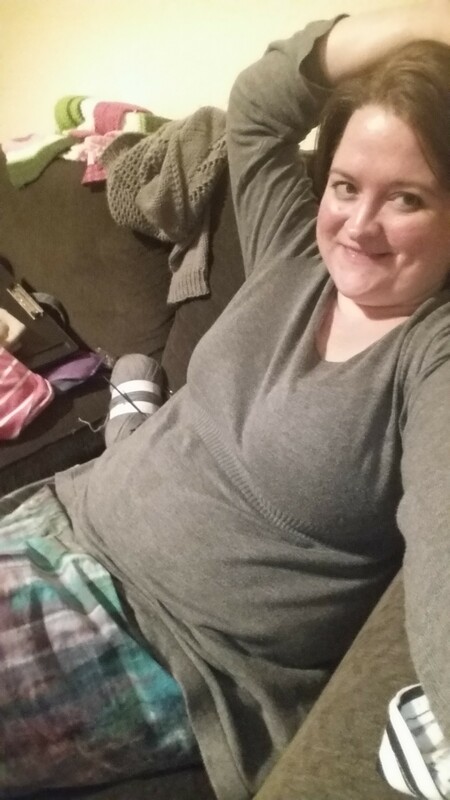 Also, I had to be at church early, so I wanted to wear a super comfy secret pajama sweater and it matched nicely. So I'm off to a Me-Made-May start and I'm looking forward to the rest of the month no matter how many me-makes I wear! Posted in General. Tags: Me-Made-May-16 on May 2, 2016 by ladyreed. This Christmas I did a lot of sewing, mostly bags. Due to working on these At. The. Last. Minute, I don't have pictures of most of them. Bad blogger, I know. I used two patterns and made them twice and then I hacked one of those for a third bag. 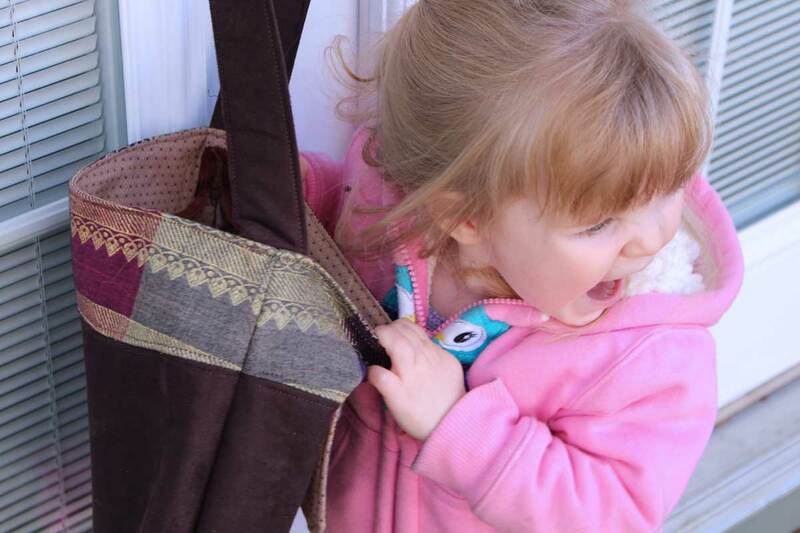 The patterns I used were both by Noodlehead, the 241 Tote and the Sidekick tote. I modified the Sidekick for the third bag. I gave the modified bag to my mom, so I'll see if she'll let me take pictures of it. 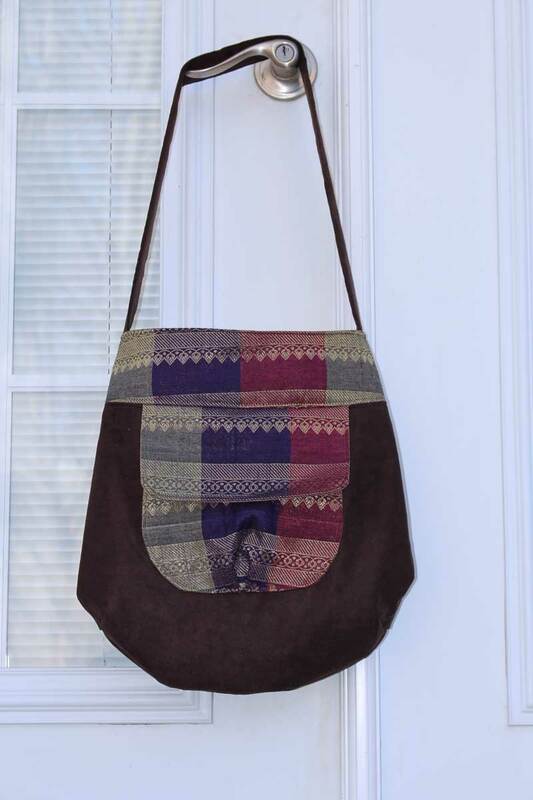 This is the 241 Tote using jewel tone brocade and brown suede. Quite classy, if you ask me. Construction was straight forward, but those curved pockets were kind of a trick. 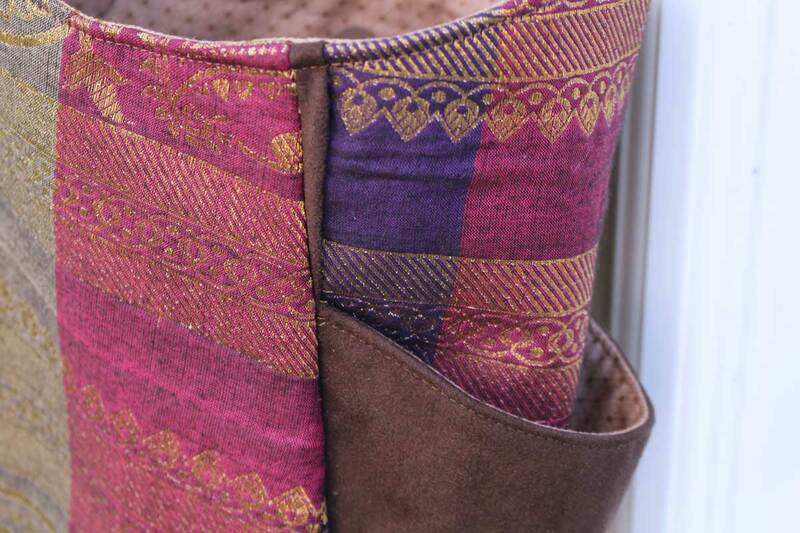 I like to interline my bags with duck and interface my outside fabric, which makes for a little bit of a thick bag. Took some manhandling to get it all lined up, but the finished product was worth it! I added bias strips to the edge of the pockets to help give cleaner lines to my busy brocade fabric. 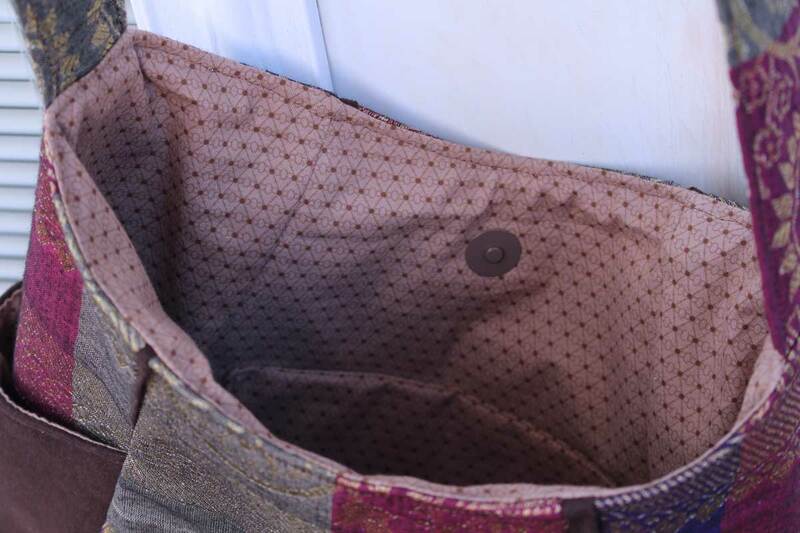 241 Tote closes with a snap and has a patch pocket inside. 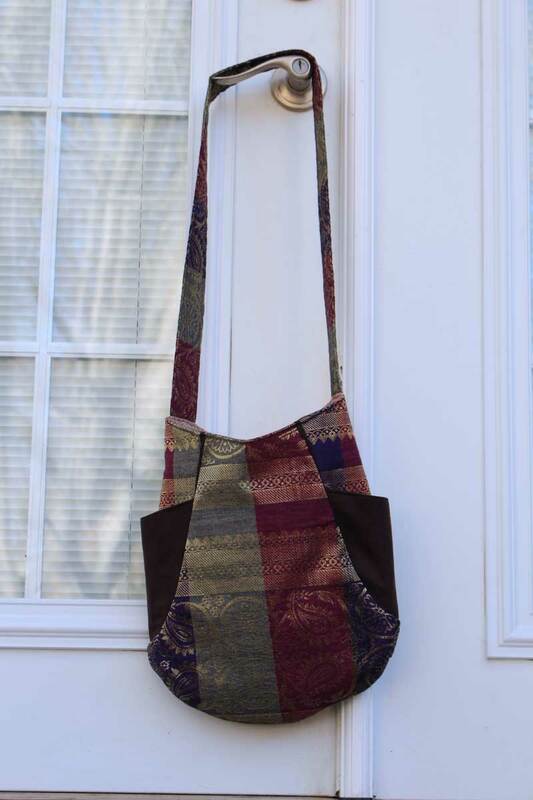 This is the Sidekick Tote in the same fabrics. This bag is a breeze to make up. No tricky seams or anything like that. 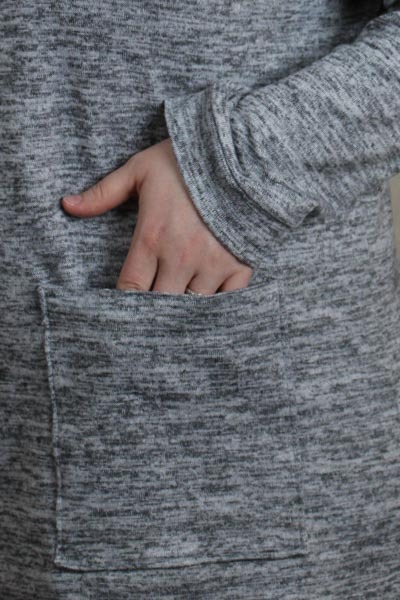 I didn't bias bind the pocket which I kind of wish I had. It wouldn't have looked much different, but I think it would have been cleaner. 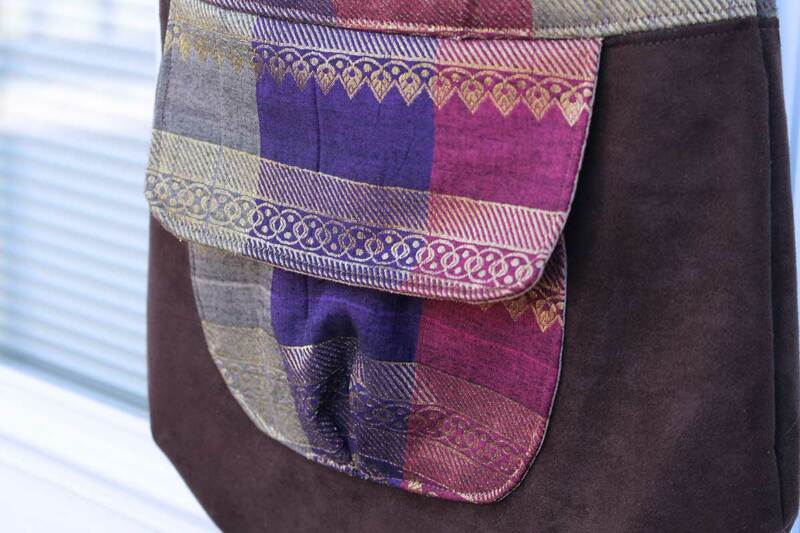 Sidekick Tote, pleated front pocket detail. 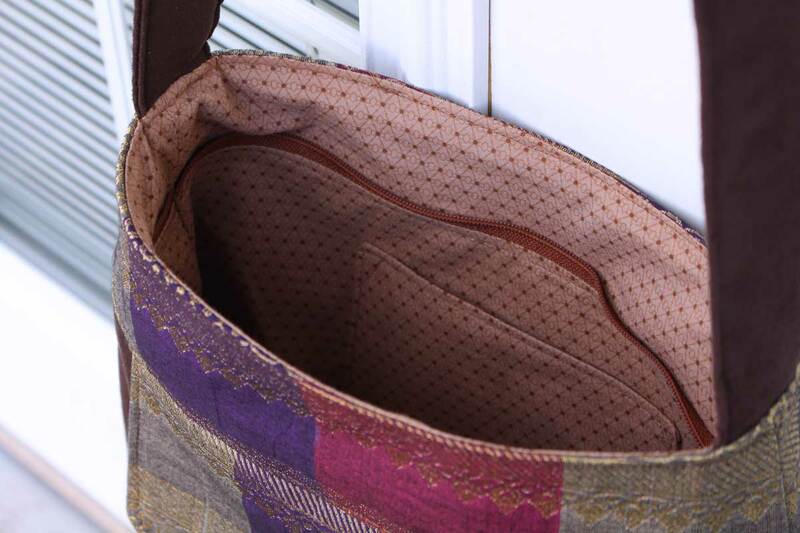 Sidekick Tote closes with a zip and has a patch pocket on the inside. For the other two, I made them in solid colors, red, yellow and blue and gave them to my two sister-in-laws, both of whom are big KU fans. So there you go. One short post that doesn't even begin to feel like it covers the work and the love that went into these bags. I guess that's just a part of the crafting process, right? Alos, here's an outtake moment from my photo shoot as my little helper was constantly trying to be in the pictures too. Wouldn't have it any other way, though! Posted in Sewing. Tags: 241 Tote, bag making, bags, Sidekick Tote on January 5, 2016 by ladyreed. 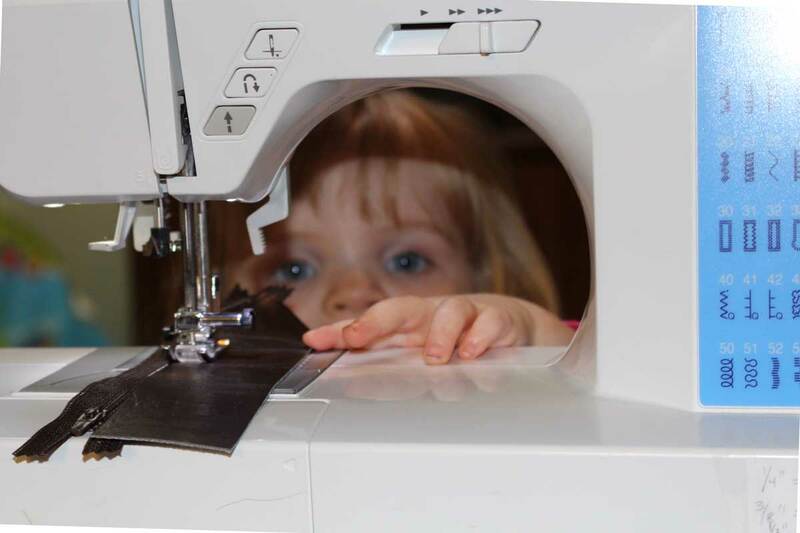 I feel like this picture sums up not only my sewing right now, but most of my life. Toddler's are so small yet they take so much time and energy, amiright? I love it, though! I wouldnt' change a thing. Ok, well, I might like a little more time to sew, but nothing other than that. I have been busy in the sewing room, although I feel like I have little to show for it. Right now it's all Christmas presents, so everything's very hush hush. I do have quite a bit to share to catch up with things and then I'll do Christmas makings revealed after the gifts are given. (I'm pretty sure none of the recipients would read this, but better safe than sorry!). 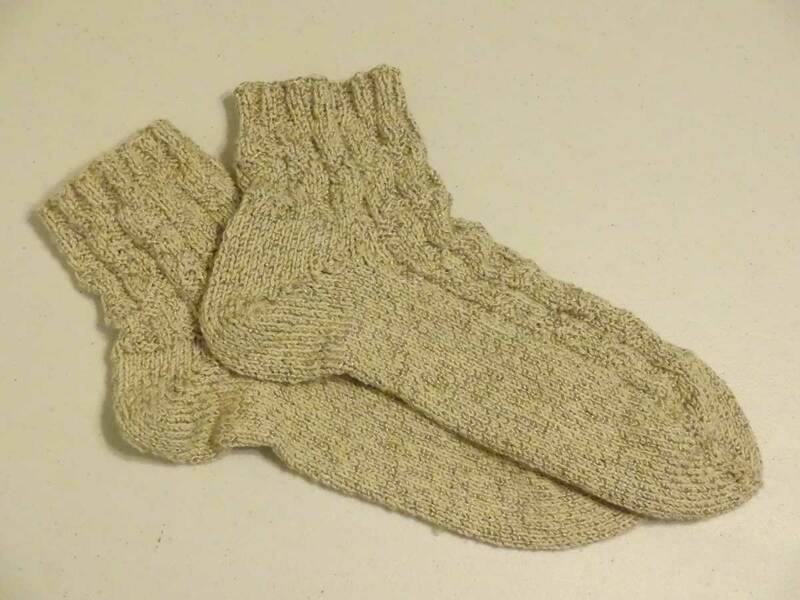 First up, I completed another set of socks for myself, the second pair I've made to date. The pattern is the Seaweed Pattern from the Craftsy class, Knit Toe Up Socks. I did a wedge toe and short row heel. I was planning on doing the gusset heel, but I forgot to stop in time, so I did the short row. I did very badly at these overall, but fortunately, It was nothing a little stitching couldn't deal with. 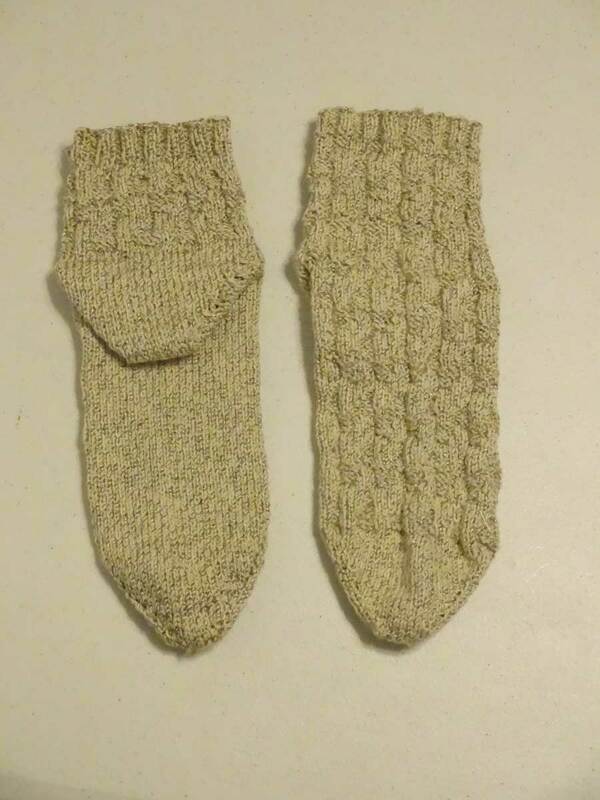 Now they look as good as if someone who knows what their doing knitted them. Ha! Anyway, I do like how they turned out finally, but I didn't like a lot about the process. First, I am terrible at short row heels. I tore the heel out on the first sock twice and then gave up and made it with holes. The second heel I didn't bother to rip out and fail again, I just left the holes the first time. There's something about the increasing part where I'm supposed to be k3tog or sssp that I'm missing. I should probably keep practicing it, but at this point, I like the gusset heel better, so I'll just use that. Lazy, I know, but c'mon, this is my hobby. Everything seems less painful after it's all done and sitting pretty on my table. In spite of the learning curve on these, I will definitely be making more socks. I feel confident enough to inflict a pair on my mom or sister/in-law, too. Posted in General on December 16, 2015 by ladyreed. Hi, I'm Mary! Thanks for stopping by! 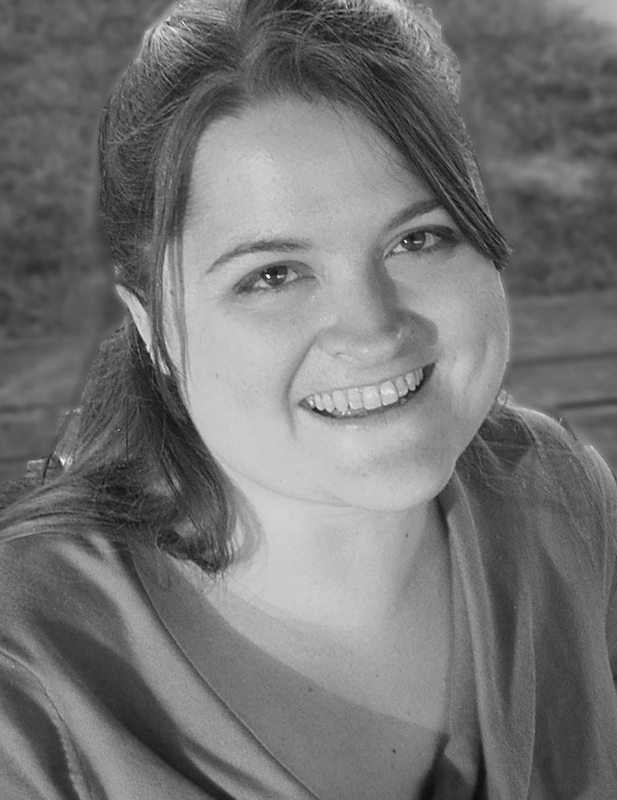 Feel free to read about my latest projects here on the blog, or click here to read more about me.